ARMSTRONG FRC, Edwards, Calif. — Arriving 49,000 feet above the test site, higher than the airlines fly, NASA Armstrong Flight Research Center test pilot Jim “Clue” Less shuts down his F/A-18’s afterburners moving just shy of Mach 1, the speed of sound, or about 630 mph at this altitude. It’s taken almost all this airplane’s got to reach this summit in the sky, but it won’t be staying long. Smoothly rolling the repurposed fighter jet so the sky and ground have switched places, Clue pulls back on the stick and points the nose down. He’s aiming for a specific point on the ground where, somewhere out ahead, NASA researchers listen to the sky as hundreds of recruited volunteers go about their daily business, ready to report on what happens next — if they notice anything at all. With the help of gravity and re-ignited afterburners, the twin-engine aircraft gracefully drops like a brick and quickly accelerates, as in really moving fast. Clue rolls the F/A-18 again to put the sky back where it belongs and punches through Mach 1. Air molecules immediately begin to protest this supersonic jet’s intrusion by generating dozens of tiny shockwaves, which as they move away from the airplane come together to bunch up into two distinct shockwaves in front of and behind the F/A-18. Normally, anyone standing on the ground as the speedy airplane flies overhead would experience these two shockwaves by hearing an often surprising, for some annoying, and usually not-to-be-forgotten BOOM-BOOM! But this supersonic dive is anything but normal. Having reached a top speed of Mach 1.1 while in a very steep curving dive, with more and more of the ground rapidly filling the view from the cockpit, Clue once again pulls back on the stick. His body presses back against his seat as he targets pulling out at 3.5 g’s, or three-and-a-half times normal gravity – just another day at the office for a NASA research pilot. NASA research pilot Jim “Clue” Less is putting his flying skills to the test while supporting low-boom flight research. As the NASA F/A-18 starts climbing again, allowing Clue to set up for another dive, and having bottomed out at around 32,000 feet, something interesting happens to the supersonic shockwaves emanating from the aircraft thanks to this maneuver. Directly below the aircraft the shockwaves concentrate into a very loud, focused pair of sonic booms. It’s not enough energy to cause damage or injury, but it’s absolutely loud enough to command immediate attention if anyone happens to be underneath. Meanwhile, a few miles ahead of the dive point, the supersonic shockwaves dutifully obey the laws of physics — in this case laws having to do with energy. If the sonic boom energy from the F/A-18 is focused and strengthened in one direction, then the shockwaves must spread out and weaken in the other direction. The result in that area: a pair of quiet sonic booms – soft thumps, really – which people on the ground, including those NASA researchers and resident volunteers, might barely notice, if they hear anything at all. So, which is it? Notice or not? NASA’s aeronautical innovators are determined to find out, and with good reason. The agency recently awarded Lockheed Martin Aeronautics Company a $247.5 million contract to build a faster-than-sound X-plane — now with the official designation of X-59 “QueSST” — that will demonstrate quiet supersonic technologies in straight and level flight over a large area. That’s a huge upgrade from diving the F/A-18, which can only “simulate” the quieter sonic thump over a very limited area below, ahead of its aim point. Part of the Low-Boom Flight Demonstration mission, the X-59 is shaped so that supersonic shockwaves do not coalesce together to create the characteristic sonic booms, which prompted the government to ban supersonic flight over land years ago. “With the X-59 you’re still going to have multiple shockwaves because of the wings on the aircraft that create lift and the volume of the plane. But the airplane’s shape is carefully tailored such that those shockwaves do not combine,” said Ed Haering, a NASA aerospace engineer at Armstrong. “Instead of getting a loud boom-boom, you’re going to get at least two quiet thump-thump sounds, if you even hear them at all,” Haering said. 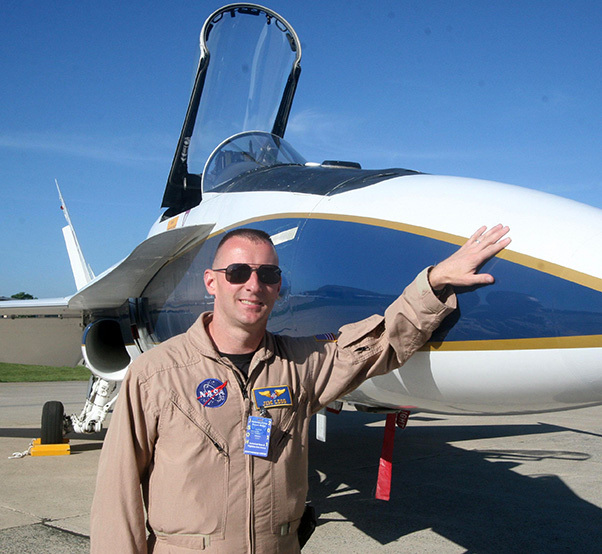 Once built, and its quiet supersonic technologies confirmed, NASA intends to fly the X-59 over several U.S. towns or cities — yet to be selected — and gather data from residents on the ground about their perception of the sound the supersonic aircraft generates. 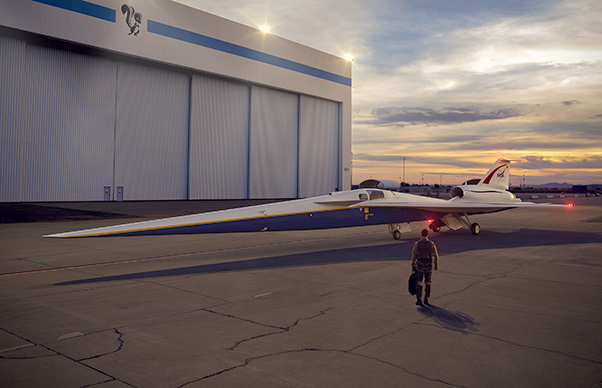 NASA researchers are confident the resulting community response data will enable federal and international rule makers to write new regulations that allow supersonic flight over land, and thus open a whole new market for commercial supersonic air travel. To prepare for those community overflights, targeted to begin in 2023, NASA acoustic engineers would like to test and refine their research methods for measuring sound levels in the field and conducting the public response surveys. “This is why the F/A-18 is so important to us as a tool. While construction continues on the X-59, we can use that diving maneuver to generate quiet sonic thumps over a specific area,” Haering said. This X-59, now being built by Lockheed Martin with NASA, will become the low-boom generator used in flights over communities. An initial test of the research methodology using the F/A-18 was conducted in 2011 with the help of the military community that lives on base at Edwards Air Force Base in California. The Waveforms and Sonic boom Perception and Response project gathered data from a select group of more than 100 volunteer residents on their individual attitudes toward sonic booms produced by the F/A-18 in supersonic flight over Edwards. 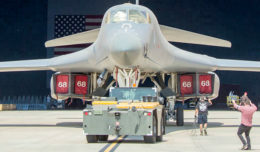 Now researchers want to take the show on the road and try the same thing over a community that isn’t used to sonic booms regularly sounding on any given day the way the Edwards community is. Using the F/A-18 and its ability to aim quiet sonic thumps at a specific area, teams from Armstrong, Langley Research Center in Virginia, and Johnson Space Center in Texas — along with industry partners — plan to conduct a series of data-gathering flights over Galveston, Texas, in November 2018. The Gulf Coast city was chosen because it was next to the Gulf of Mexico, which enables the F/A-18 to keep its louder sonic booms (near the dive point) out to sea, while throwing the quieter sonic thumps (far forward of the dive point) at Galveston. At least 500 resident volunteers will be solicited to provide input to a secure web site about what they’ve heard, if anything, and what they felt about the sound. At the same time, audio sensors strategically placed around the city will provide researchers a measure of scientific ground truth about how loud the noise really was. “We’ll never know exactly what everyone heard. We won’t have a noise monitor on their shoulder inside their home. 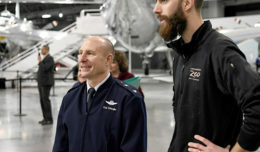 But we’d like to at least have an estimate of the range of noise levels that they actually heard,” said Alexandra Loubeau, NASA’s team lead for sonic boom community response research at Langley. Researchers do have a target perceived decibel level in mind for the X-plane — a number the F/A-18 also can generate with its dives — that they think will be acceptable to the community. The practice data recorded in Galveston may begin to prove their theory about what the right noise level should be, but it won’t be until the X-59 begins flying and finishes its community overflights that final conclusions will be drawn. “The test in the fall will really help us refine how we are going to ask the survey questions, how we are making the noise measurements, and then how we are conducting the data analysis,” Loubeau said.